It’s been an eventful week in college football (and schools with USC as their initials) as one of the great coaches retired from the college ranks and another was fired for personal issues. On Monday of this week, after The Kickoff had published Vol. 65, Issue 7, South Carolina’s Steve Spurrier announced he was resigning in order to help the Gamecocks with recruiting. The team (2-4 overall, 0-4 SEC) take on Vanderbilt in Williams-Brice Stadium on Saturday at 4 pm with Shawn Elliott serving as the Interim coach. At age 70, questions about how long Spurrier would remain arose among recruits. He said he isn’t retiring from coaching but may focus his energy at the high school level. Possible candidates mentioned to replace him include Kirby Smart, Lane Kiffin, and Will Muschamp. At the other USC, the University of Southern California, Coach Steve Sarkisian was fired on Monday after reports that he had been drunk during a game and at a team meeting. He publicly apologized in August for showing up drunk at a pep rally but claimed he did not have a drinking problem. The Trojans are 3-2 this season with Clay Helton stepping into the interim head coach role as they play Notre Dame. Last week offered some amazing highlights as Texas played a flawless game to knock off Oklahoma and Georgia not only lost to Tennessee 38-31 but also lost RB Nick Chubb, presumably for the rest of the year. The Bulldogs join Georgia Tech and Oregon as cold on the Kickoff Thermometer this week, while the heat is on for Michigan, Texas and Utah. Washington upset USC, Va Tech beat NC State, Wake Forest shut out Boston College, South Florida beat Syracuse, and Washington State shut down Oregon. The Kickoff’s Games of the Week are a couple of SEC matchups as No. 10 Alabama hits the road to play No. 12 Texas A&M and No. 9 Florida travels to No. 5 LSU. We expect Bama, which won 59-0 last year, to win, although Texas A&M is the one that’s undefeated and the Power Ratings for these teams are closer than we would have expected headed going into the season. Which should make for a pretty good ballgame to watch. Watch the game Saturday at 3:30 ET on CBS. The Gators lead the series against LSU by 1 game when playing in Death Valley. Both teams go into this undefeated, but we think Les Miles will be the one with the smile after time expires. Watch the game Saturday at 7 pm ET on ESPN. Speaking of the SEC, the conference is back on top of the Pac-12 in our Conference Breakdown through week 7. Also in this week’s issue, we looked at overall trends through last week with the home favorites winning 83.3% of games so far and road favorites winning 81.4% so far. Nine of the top 10 teams on the Kickoff Top 25 this week are undefeated: TCU, Ohio State, Michigan State, Utah, LSU, Clemson, Baylor, FSU, and Florida. When you subscribe to The Kickoff, you get those stats, plus our Kickoff Power Ratings, schedules and results for FBS and select FCS teams, and much more. 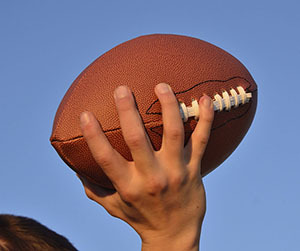 The Kickoff is your resourceful guide for putting the season’s college football action into context, all delivered in a concise format that lets you find just what you’re looking for when choosing your picks. Also, test your knowledge of college football by participating in our Thursday Throwdown questions. We’ll see whether you know your stuff! Talk to us this weekend while we watch the games. Which upsets are you expecting? How is your team doing so far this year? Sound off! Use the hashtag #thekickoff on Facebook (https://www.facebook.com/TheKickoffZone?ref=hl ) and Twitter ( https://twitter.com/TheKickoffZone ) so we can follow your conversations. Weather could be a factor as the edge of Category 4 Hurricane Joaquin threatens to dump a LOT of rain on Georgia. 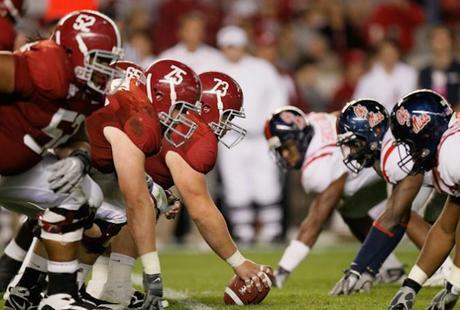 Alabama and Georgia last met in 2012 (when Bama was on its way to a second consecutive BCS National Championship), but the Tide and Bulldogs are set to play in one of The Kickoff’s Games of the Week, along with Notre Dame playing at Clemson. Weather could be a factor in both of these games with the edge of Category 4 Hurricane Joaquin threatening to dump a LOT of rain on the East Coast, which is already waterlogged. Ten to 15 inches of rain and wind gusts of 160 mph are expected in the storm’s path. A lot of surprising things can happen when you’re fighting the elements the same time you’re battling a skilled opponent. On the field, Alabama leads the series with Georgia 37-24-3. They last met at the SEC Championship Game that Bama won 32-28. Mark Richt’s team finished 12-2 that year. Heading into Saturday’s game, Georgia sits at No. 7 and Alabama is No. 12 on our Kickoff Top 25 (AP has the Tide at No. 13, Georgia at No. 8). We’re picking the Bulldogs to win this one by a slim margin, even though Bama leads the series 12-7 while playing in Athens. The outcome of this one will have a big impact, no doubt about it. Tune in to CBS at 3:30 pm. If you haven’t yet read this week’s issue of The Kickoff newsletter — delivered every Monday to subscriber’s email inbox or sent first class mail – our Kickoff Thermostat has Florida, Mississippi State and Northwestern rising with the heat of success while Tennessee, Oregon and Arizona State are feeling the chill. After last week, the Gators are 4-0 and the Volunteers are still in disbelief that they have had two 4th quarter leads over 10 points vanish. Last week’s upsets included Memphis 53-48 over Cincinnati, Michigan shutting out BYU 31-0, Duke beating Georgia Tech 34-20, ECU defeating Virginia Tech 35-28, Army slamming Eastern Michigan 58-30, James Madison beating SMU 48-45, Kentucky beating Missouri 21-13, and Utah dominating Oregon 52-20. Georgia Tech, Oregon, Missouri, and BYU fell off our Top 25 completely after being ranked Nos. 19, 14, 22, and 17 last week. Utah jumped five spots. Our News and Notes also covers last week’s performances by Brett Rypien at Boise State, Christian McCaffrey at Stanford, De’Veon Smith at Michigan, Leonard Fournette at LSU, and Trevone Boykin and Josh Doctson at TCU. When you subscribe to The Kickoff, you get those stats, plus our Kickoff Power Ratings, charts of winningest programs by percentage and win totals, a conference breakdown through issue 5, the 2015 Out-of-Conference records so far, overall trends through last week, strength of schedule ranking, our Playoff Seeds, a look back to our ranking in September 1998, and schedules and results for FBS and select FCS teams. The Kickoff is your resourceful guide for putting the season’s college football action into context, all delivered in a concise format that lets you find just what you’re looking for when choosing your picks. Also, test your knowledge of college football by participating in our Thursday Throwdown questions on Facebook. Talk to us this weekend while we watch the games. Sound off! Use the hashtag #thekickoff on Facebook and Twitter so we can follow your conversations. Things got off to an exciting start Thursday night as North Carolina and Minnesota gave South Carolina and TCU a run for their money. With a season as successful as last year, we doubt Trevone Boykin and the Horned Frogs will be left out of the playoffs again; we picked Boykin to our 2015 Preseason Kickoff All-Americans list. As we predicted, Utah spoiled Jim Harbaugh’s debut at Michigan. Arizona, Georgia Tech, Hawaii, Nevada, Oklahoma State, Utah State, UConn, San Jose State, Wake Forest and Western Kentucky all won their games Thursday night. We are thrilled to see this weekend’s matchups and finally get answers to the questions fans have had all year: Will Alabama play well enough against Wisconsin to deserve their high pre-season ranking? Can Virginia Tech spoil Ohio State’s bid to repeat as National Champs? How will Boise State players react to Chris Petersen’s return with Washington? Can teams, coaches and players live up to the hype? Which young quarterbacks will best respond to the pressure? Everett Golson, Baker Mayfield and Vernon Adams won their respective QB jobs at Florida State, Oklahoma and Oregon, but we’ll just have to see who Nick Saban and Urban Meyer send in for the first series. Earlier this week, The Kickoff published our first issue of the college football season. No doubt some of you have already consulted our Power Ratings before making your picks for this weekend. It’s not too late to subscribe so you can receive 16 more weeks of our newsletter, plus an additional six issues published during the off-season. Each Monday, we push it to your email inbox in PDF form or mail the printed version to your home or office. 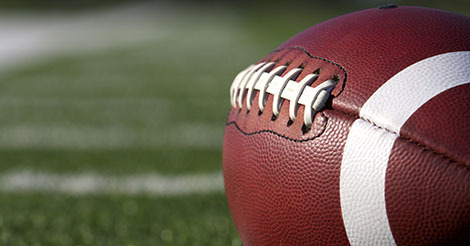 Just like you, we’ll be glued to our television sets this Labor Day weekend, feasting on football after a long fast. The faces on the tube are changing a bit. Former Alabama Quarterback Greg McElroy replaces Tim Tebow on SEC Nation. Rece Davis is poised to take over ESPN’s College GameDay, replacing longtime host Chris Fowler. Love them or hate them, Mark May and Lou Holtz will be tough to replace on ESPN Gameday Final, but we’ll see how Joe Tessitore and Joey Galloway do. Some of the breakout players we’ll be paying close attention to: Jeremy Johnson of Auburn, Derrick Henry at Alabama, Anu Solomon at Arizona, Seth Russell at Baylor, Jared Goff at Cal, Deshaun Watson at Clemson, Dalvin Cook at FSU, Brad Kaaya at Miami (Fla.), Malik Zaire at Notre Dame, Mason Rudolph at Oklahoma State, Royce Freeman at Oregon, Joshua Dobbs and Jalen Hurd at Tennessee, Kyle Allen at Texas A&M, and Cory Clement at Wisconsin. Talk to us on social media this weekend and let us know which teams and players you think are overhyped, which upsets you expect to see and what your own predictions are. Our Facebook Page is https://www.facebook.com/TheKickoffZone , our Twitter is https://twitter.com/TheKickoffZone and you can find us on Google+ at https://plus.google.com/u/0/b/115092886371908088449/115092886371908088449/posts . Include the hashtag #thekickoff so we can follow your conversation. Who Will Win the Quarterback Races? With less than two weeks before the start of the regular season, it is crunch time for teams to choose their starting quarterbacks. Will it be JT Barrett or Cardale Jones at Ohio State? Jake Coker or David Cornwell at Alabama? Everett Golson or Sean Maguire at Florida State? We’ll soon know. Braxton Miller simplified things a little bit by moving to receiver for the Buckeyes, but we still don’t know for sure who will take the first snap against Virginia Tech. Urban Meyer promised no announcement will come before Sept. 7, but he’s in a good position with two proven winners in the running locked in a fierce competition for the starting job. It’s possible that Barrett may start under center with Jones running the option. That’s a scenario sure to cause headaches for defensive coordinators. We questioned whether the quarterback questions at Alabama are reasons to feel the Crimson Tide is overrated in preseason polls. After all, Jake Coker was supposed to set the world on fire last year and ended up as a backup QB. You’d think he would be the sure pick with another year under his belt to learn the system, now there’s word Coker’s dealing with a foot injury and has missed practices. That heightens speculation about redshirt freshman David Cornwell becoming the starter if Coker isn’t healthy. Of course, with so much talent, Nick Saban also has true freshman Blake Barnett or Alec Morris or Cooper Bateman to throw in the mix. The Tide starts the season Sept. 5th at AT&T Stadium. “Coker failed to really separate himself from the pack, due to inconsistent play throughout spring practice. The spring game official rosters had Coker listed first team and Cornwell 2nd. That being said, it was Coker who had the best spring game showing, though Saban refrained from naming him the starter at that point,” Duff said. Jimbo Fisher faces the daunting task of replacing Jameis Winston. Golson, the former Notre Dame quarterback, seems more likely to fill Winston’s shoes – if he’s had time to learn the FSU offense. The Seminoles open at home against the Texas State Bobcats on Sept. 5th. competition to replace Jameis Winston, but coach Fisher noted his inconsistent play during the spring game,” Duff said. Things have gotten interesting in Oregon after dual-threat player Vernon Adams passed summer school. Jeff Lockie was Marcus Mariota’s backup, so he may be better positioned to get the job. The Ducks play Michigan State on Sept. 12th. 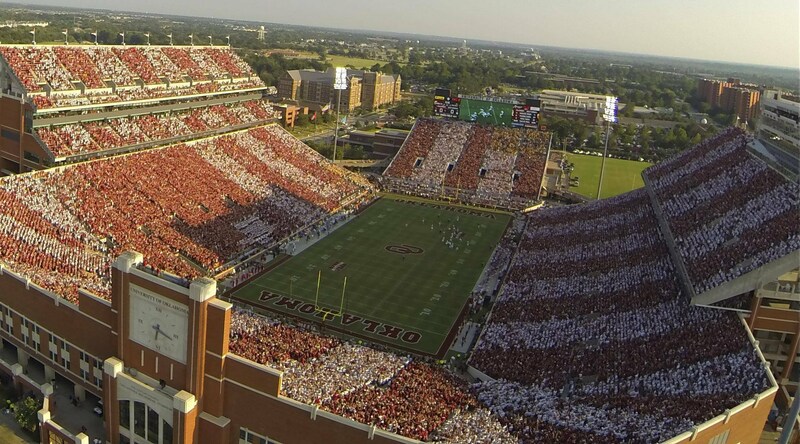 At Oklahoma, two-year starter Trevor Knight may lose the job because of past turnovers to Baker Mayfield if the Texas Tech transfer hasn’t been affected by “shoulder fatigue” reported in the offseason. Also in the mix is Cody Thomas. The Sooners play Akron on Sept. 5th. “Knight entered the 2014 season expected to have a breakout season after leading the team to a victory in over Alabama in their bowl game. It was much different this spring (after an injury shortened and disappointing season) as Knight found himself in a 4 way competition to hold onto his job. Some around the program had expected Mayfield to take over the spot, but he threw costly picks in the spring game. None of the four QBs were able to make any real separation in spring,” Duff said. We’ll know the answers to these questions in just a few days! 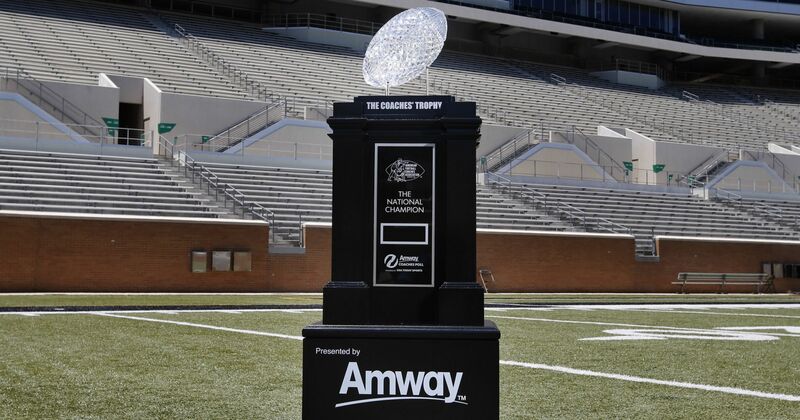 The 2015 preseason Amway Coaches Poll came out Thursday, and it was no surprise to find the defending national champions in the top spot. Second-ranked TCU and No 3 Alabama each claimed one first-place vote apiece. Tommy Duff, editor of The Kickoff newsletter, said he disagreed with where several of the teams ended up on the poll, mostly because there are so many untested quarterbacks in the mix. 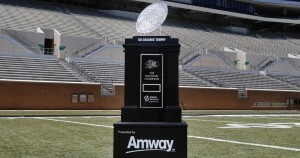 The Amway Coaches Poll is conducted weekly throughout the regular season using a panel of head coaches at FBS schools. Each coach submits a Top 25 with a first-place vote worth 25 points, second place 24, and so on down to one point for 25th. 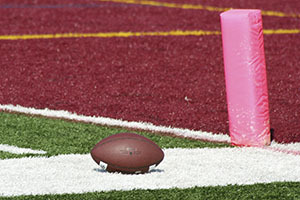 The Kickoff’s own Pre-season coverage, ranking the teams based on how we expect their season to end, launches later this month – take advantage of a Buy 1, Get 1 special on individual subscriptions for a limited time so you can consult the Kickoff’s Weekly Power Ratings each week during the college football season! So much of how these teams end up hinges on how fresh talents react to the challenge. Duff believes the teams with All Conference quarterbacks returning will see a distinct advantage over those adjusting to growing pains. “Jacob Coker has had a year to get ready to lead Alabama’s offense after failing to get the quarterback spot last fall, but he only has a year left. Oregon (ranked No. 5) is going to play well, but they aren’t going to break away without Mariota, their Heisman winning quarterback. Florida State (No. 8) is overrated, bringing in a transfer at quarterback who has just started practicing and has to pick up the system fast. I would have ranked Auburn higher (No. 7) because their quarterback has potential and has been a starter in a big game before,” Duff said. 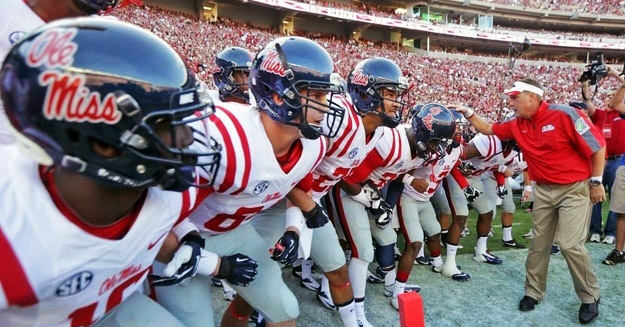 Eight SEC teams begin the season in the top 25; five of them (Bama, Auburn, No. 13 LSU, No. 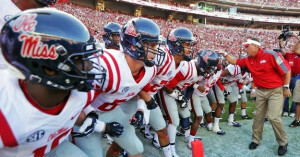 15 Ole Miss and No. 20 Arkansas) represent the West Division. Georgia is ranked at No. 9 in the Coaches poll, Missouri is No. 23 and Tennessee is on there at No. 25. Also earning spots in the Coaches Poll Top 25 are Michigan State (6), USC (10), Notre Dame (11), Clemson (12), UCLA (14), Arizona State (16), Georgia Tech (17), Wisconsin (18), Oklahoma (19), Stanford (21), Arizona (22), and Boise State (24). “I think Boise State could run the table with their schedule,” Duff said. They face Washington, BYU, Virginia, Hawaii, Colorado State, Utah State, Wyoming, UNLV, New Mexico, Air Force, and San Jose State. We’ll begin to know more after their first game on Sept. 4th.